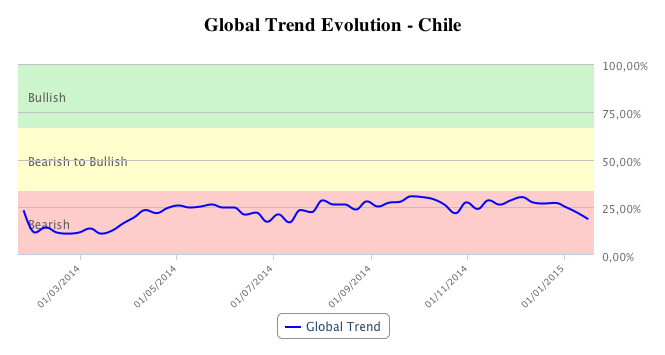 Chile is one of the most stable and developed economies in Latin America. In these last years of the Great Depression, the country increases its GDP with a very good strength. However, the economy suffered a drop in their growth in 2014. Chile is very dependent from copper exports, as it is the largest world producer. 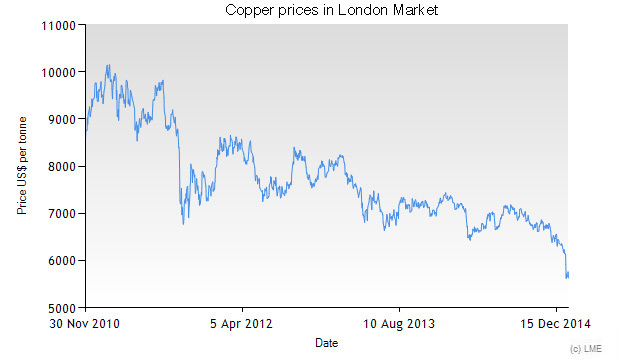 Copper exports sum up to 60% of the whole figure. Last year, the country had to deal with two negative impacts: the hard fall of the copper price and the declining demand from China, the main consumer. However, OECD outlook and the own country figures are more positive for 2015. Political and economic stability are the main values for this country in a region with regular financial earthquakes. In the stock exchange, the main index IPSA had a better development after the minimum last February. Last weeks, the reference index fell due to the current world financial markets instability. Generally speaking, the trend is still a bit weak, but the index closed 2014 with black figures. What are the winners and the losers in the IPSA main index in Chile Stock Exchange? The top is composed by a very varied group: two energy providers (Colbun and Edelnor), a pharma (CFR), a paper producer (Empresas CMPC) and a wine producer (Viña Concha Toro). On the other hand, the main loser is a mining company (CAP), reflecting the branch situation. Other big losers are a building group (Besalco), a transport company (Cía. Sudamericana), a industrial producer (Embotelladora Andina) and a retail (Ripley). This entry was posted in Country report and tagged Chile, Copper, IPSA, OECD on January 23, 2015 by Oscar Garcia.